Patrick loved his animals so much and especially his best friend, a little brown daschund named Bud. A chapter in this book tells the story of this mighty little dog and how Bud gave so much joy to Patrick as he fought rhabdomyosarcoma, a rare form of childhood cancer, the number one child killer disease in America. 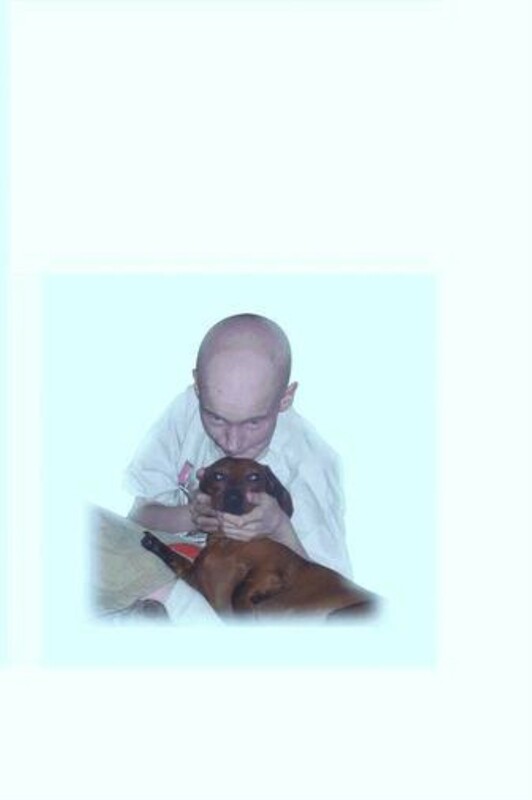 More importantly, this little brown daschund adds a unique twist as he describes his grief over Patrick's death in the foreword to the book while urging everyone to join him in fighting children's cancer. I’ve been looking for Goosie for what seems like endless days and nights now. It is hard to sleep without Goosie around, and I can’t find him anywhere: upstairs, downstairs and every time the doorbell rings, I run, but nowhere do I find my Goosie. I remember when I first met Goosie. I was at this little run down house and Goosie, his ‘Da’ and Sarah came inside. Goosie played with me and my brothers and sisters for a few minutes, and then he picked me up and carried me out the door with him. I was afraid, at first, but Goosie made me feel at home from the beginning. I liked my brothers and sisters pretty well, but there was not enough to eat, where I came from, and I never had real love until I met Goosie and his family. “But where in the world is Goosie now?” I have wondered, every moment I am awake. In the past, he used to go away for days at a time, but he always came back home. A few months ago, I found out where Goosie goes when he leaves me here alone. You see, one time a few months ago, his aunt Becca came and got me and took me to this place where Goosie was. It was a big building with lots of rooms, and there were women there in strange outfits, who would always bring things to Goosie and sometimes stick Goosie with needles. It was all I could do to avoid attacking one of them, because it didn’t seem like my Goosie was very happy. But, I behaved very well because I thought that they would let me come back and see him again if I acted real good. I was always so happy when Goosie came back home, and I miss him so much now. I loved Goosie so much. This is the longest he has ever been away. I was always good to Goosie. If anyone came near him that I didn’t know, I made sure I was ready to attack, if necessary, to protect him. Goosie was so nice to me. He always made sure I had everything I wanted, and he always held me and made me feel so warm when I was cold, especially at bedtime. Now he isn’t here, and I search most of the night for him. I went to his Papaw’s house the other day, and Goosie’s family was there. I searched from room to room, but no sign of Goosie. I went to his Granny’s house and ran upstairs and downstairs and all over the place, but no Goosie. I’ve been just up the road to the park that has Goosie’s real name, Patrick, on a sign in the front. They said that thousands of dollars from people who loved Goosie were used to build this park for dogs to run and play. When I went to the park, I had fun, but I still couldn’t find Goosie anywhere. At night time, I sleep on a couch with Goosie’s ‘Da’. I miss Goosie so much. I always did my best to protect my Goosie. I never let people touch him unless I knew it was okay. Once I even attacked his Aunt Becca, because I wasn’t sure about her. If I knew who or what has taken my Goosie away from me, I would be attacking it day and night. I heard his ‘Da’ say it was a disease called cancer. Please help me attack cancer, because it took my Goosie away from me. Check back often for more about Patrick "Goose" and his little brown daschund, Bud and how they prompted this book and the building of a dog park in Kentucky.